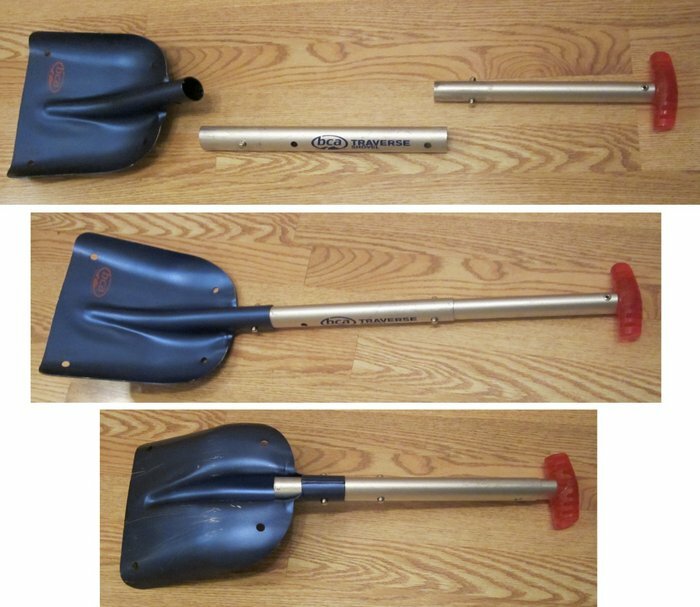 The Backcountry Access Traverse EXT Shovel is an aluminum backcountry snow shovel with a handle that is removable from the blade and also extends. The blade is made from 6061 Aluminum and is blue. The blade has four holes (one at each corner) that can be used for things such as rescue sleds and anchors. At the top of the blade an oval tube protrudes, which the handle fits into. This tube has a set of small holes which the “buttons” on the handle fit into…more on that later. The handle is oval in cross-section, and is made from two aluminum pieces which telescope. The top of the handle has a plastic t-grip. Near the bottom of each piece of the handle is a set of silver “buttons”. These buttons are mounted on a U-shaped spring inside the handle. They are used to lock the handle pieces into place on the blade and on each other. The buttons on the lower piece of the handle can be pushed in to slide the handle into the blade, and when the buttons line up with holes in the blade they pop back out, locking the handle in place. If I wish to remove the handle, I can depress the buttons and pull the handle out. A similar system is used to extend and retract the handle, with buttons on the upper section of handle and holes on the lower section of the handle. I have been using the Traverse shovel as my avalanche shovel since the winter of 2008. Since that time, I have used it to dig snow pits, do snow study tests (e.g. 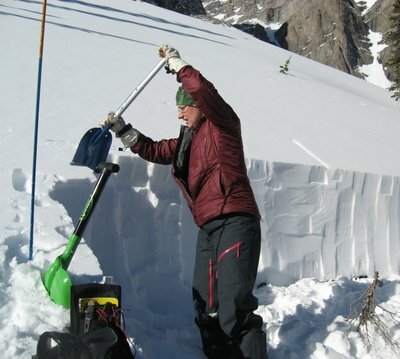 compression tests), dig through avalanche debris, dig through simulated avalanche debris (e.g. snow ploughed from roads), dig several shelters, and dig out a couple stuck vehicles. I have also used it once as a sled to sit on while sliding down a snowy (and rocky) slope. I estimate that I have used the Traverse shovel about 25 times for digging, in addition to carrying it around a lot, in temperatures ranging from -25 C (-13 F) to 10 C (50 F). I carry the blade and handle separated, and both (along with my probe) in an exterior pocket on my pack that is stretchy and has a drain hole. The top of the pocket is covered by the lid of my pack, so I can reach the shovel quickly but don’t risk catching it on something or losing it in a fall or avalanche. This shovel is stored full-time in my search & rescue pack in the winter, always ready for action. The Traverse shovel is a good lightweight avalanche shovel. I like the fact that the handle extends, which allows for a more natural shoveling position than with the handle retracted. It is also good to be able to use the handle retracted; having both options allows for flexibility in a tight spot. The length of the retracted handle comfortably fits where I like to carry it in my pack, so it works great for me. The size of the blade is decent, though smaller than some other shovels, especially newer ones. It’s big enough to be reasonably effective, but not so big that I can’t manage shovelfuls of snow. On the other hand, it does take me longer to dig with this shovel compared to some other shovels that I’ve used. I’m not a very strong person, and avalanche debris is heavy, so I don’t want a massive blade on my shovel, but I could manage a bit more snow than this one holds. I like the handle being oval. Backcountry Access says this is for strength. What I know is that the handle only fits into the blade in an orientation where the buttons line up with the holes, which means I never have to fiddle around with getting everything lined up. I have had a couple of instances when I depressed the buttons too far and one popped into the handle. Although it was inconvenient, a little bit of fishing around or poking from the end of the handle was able to get the button back into place. Although it’s only been an inconvenience so far, I hope it doesn’t happen during a real avalanche incident. The back of the shovel is smooth and fairly flat, so achieving a nice flat wall on a snow pit is possible with a little bit of practice. It’s not my personal strength, but it is possible. The edge of the blade is sharp enough to cut through compacted snow and thin crusts, and with a bit of chopping will also cut through a thicker icy crust. The Traverse shovel has held up well to use. The edge of the blade shows some scratches and signs of use. The back of the blade also has quite a few scratches from using the shovel as a sled on a barely-covered-in-snow rocky slope. Functionally, the shovel is as good as new. 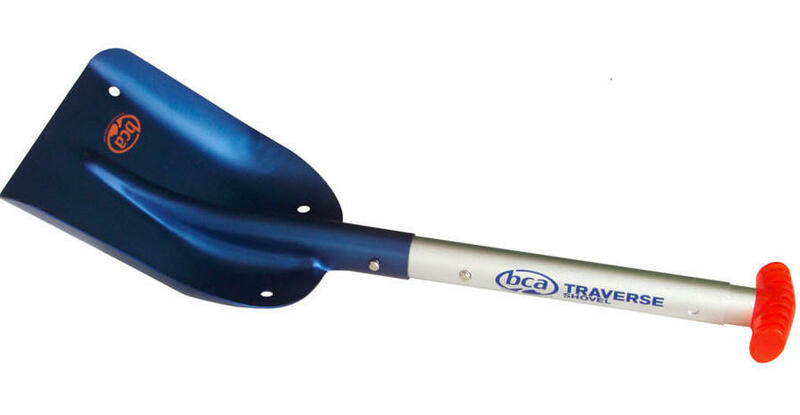 The Backcountry Access Traverse EXT shovel is an aluminum avalanche shovel with a removable and extendable handle. It is easy to use and also easy to carry.